Five times a year my mentor and friend Miranda Gray sends a powerful transmission of energy to women all over the world. It’s called the Worldwide Womb Blessing, and the final one of 2017 is happening on December 3. 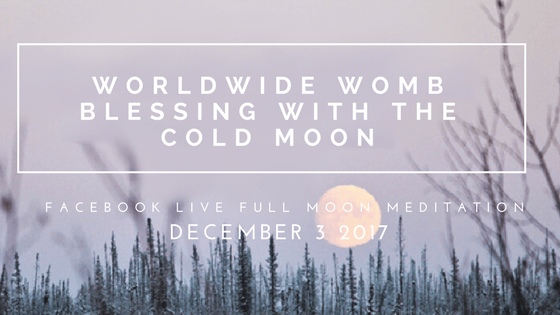 So for this month’s full moon meditation, we’ll be joining 160,000 women worldwide with our own virtual Womb Blessing circle to guide you step by step to receive the energies. December’s full moon is known as the Full Cold Moon. Some Native American tribes also referred to it as the Long Nights Moon, as it is leading us towards Winter Solstice and the year’s longest night. And whether you’re in the Northern or Southern Hemisphere, this moon is the last of the year. For those of us in the Northern Hemisphere, winter is setting in. The silence of snow will soon be descending. While the nights lengthen and frost covers the earth, we receive a reminder to explore our own fertile grounds that lie buried underneath. Now we are called to go within. Deep within ourselves, our desires, our fears, and our darkness. Whether we are trying to conceive or not, Miranda Gray tells us, the womb energy centre is how we perceive the world. Its energies, its cycle, and its goddess archetypes affect us physically and emotionally. The power of the Womb Blessing and the collective energy of many women gathered together gives us the support and courage we need as we answer the Cold Moon’s call to tap into the gifts of our darkness. Whatever it is you long for, a part of you must first be reborn before you can bring forth new beginnings. It is from our womb centre that we create this rebirth. It often takes great courage to dive deeper into the heart’s true yearnings, yet this is where the treasures of self-knowing lie. Perhaps there is a stirring in your body and soul that can provide you with a roadmap for making 2018 your most attuned year yet. Meditating on this will help complete the cycle of blessings received in 2017, whether they have been challenging, joyful, or both. Maybe you took a leap into fertility support via fertility coaching, IVF, IUI, or FET. Maybe you faced the challenge of not getting pregnant. Maybe you are striving to achieve birth of an entirely different sort: a new love, a change in career path, a creative blossoming. Let the darkness of this first winter month provide you with a canvas to explore the inner light of your own desires as we approach the New Year. Our circle will gather at 6:30 pm Eastern, 3:30 pm Pacific, 11:30 pm UK on Sunday, December 3. Try to make it live if you can — but don’t worry if you can’t, a replay will be available and the energies will be waiting for you. ===>> RSVP to add your name to our live cast guest list and request access HERE. ===>> Enter your registration details on the official Worldwide Womb Blessing site and choose 24:00 on the registration page HERE. To learn more about the Worldwide Womb Blessing see: http://www.wombblessing.com.